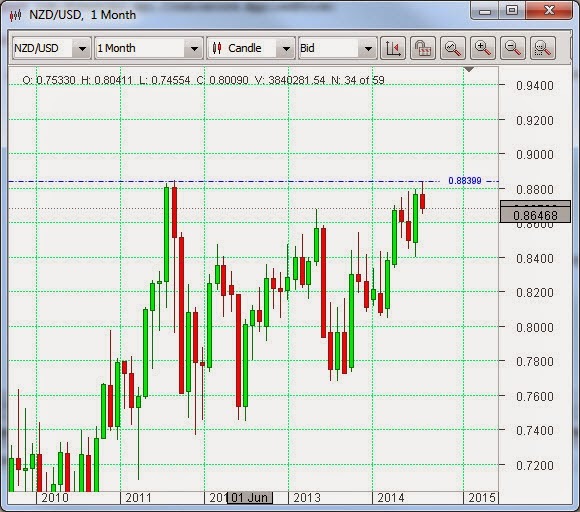 A look at the chart above will tell us that the New Zealand dollar (NZDUSD) is close to the highest it has been since mid-2011. The Reserve Bank of New Zealand is expected to raise interest rates again later tonight in GMT terms. It has placed its trust in so-called macro prudential policies to curb a property bubble which, they believe, allows them to continue to raise interest rates. These have been rejected in Australia. In the UK, they are in place, but the jury is still out about whether or not they are effective there. The strong Kiwi, however, is still placing some stress on New Zealand exports. According to the Bank’s Statement of Intent (SoI), issued recently, price stability, a sound and efficient financial system and meeting the public’s currency needs are its targets. They have, indeed, just introduced new currency notes, but the most important thing for us is the reference to price stability. This indicates that inflation is up front and centre in the thinking of the central bank. If it happens, a rise in rates later today will probably be the last in the series. The market likes to price in these rises before they happen, so a failure on the part of the Reserve bank to live up to expectations will be met by a further reduction in the currency, to match that which took place recently on the news that inflation in NZ was lower than heretofore. Even a raising of the cash rate, being the last in the series, may not strengthen the New Zealand dollar as much as might otherwise have been expected.